※ An aperture plate to select a suitable irradiation diameter. 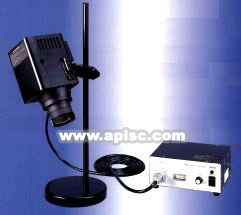 ※ The original optical system to eliminate the shadow of the lamp. ※ An exhausting duct (an optional item) to use the device in a clean room. ※ 15V 150W Halogen lamp, 150/15L or 300/15L (Pack of 6 lamps). ※ Spare lamp socket, LS15/150 (Pack of 4 sockets).